Happy Monday! I hope you had a great weekend. I can't complain, it was nice to be home. Plus it wasn't snowing! I mean it's still cold as heck but it wasn't snowing! Each day that goes by means one step closer to spring! Today I have, as I said in the title, my newest addiction. I have always been very into nail and cuticle care. I have a large collection of hand care items. 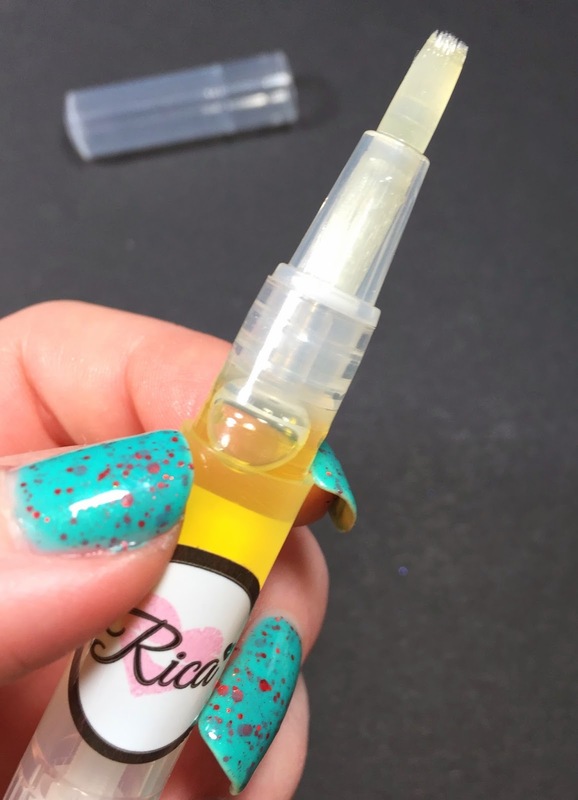 When I hard that Rica was going to be offering cuticle oil I knew I was going to have to get some. Because y'all know how addicted to her top coat I am! That link includes all the in depth information about the oil itself. She put so much thought and effort into these and I am so impressed. She even formulated the oils to be mindful of those with nut allergies because she has a child with nut allergies. This has become my new favorite oil. I can put this on and in no time it has soaked right in and my hands do not feel greasy. I apply this stuff so often. Mainly because the cold weather here is brutal on my hands. But this stuff is doing it's job and my cuticles look great. All I have to do is click it up a few clicks and glide it right on my nails. Done. 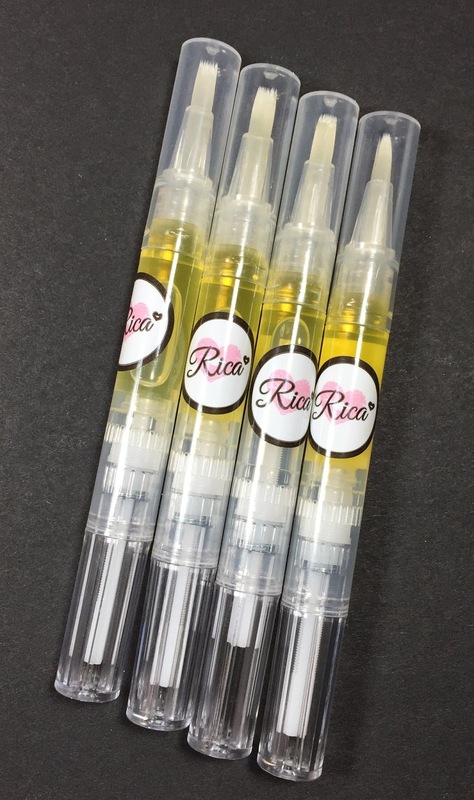 If cuticle pens are not your thing, she also offers a roller ball (10ml) and a bottle (16.5ml). The pens retail for $4.25, a rollerball is $8.00, and the bottle is $9.00. This is of course as of today. The scents are out of this world. She just keeps adding more and more. My goal was to own each scent but at the rate she's going I am not going to be able to do it, my wallet won't let me. I have placed two orders and just tonight I placed another one. 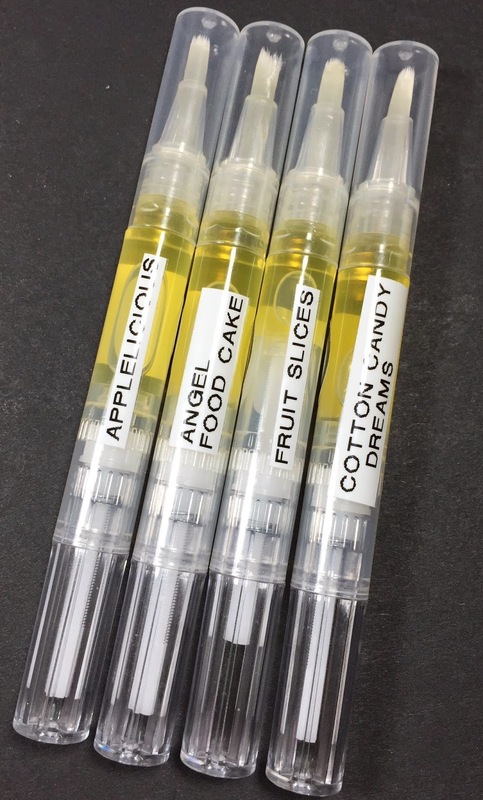 I have Fruit Slices (which is my absolute favorite), Cotton Candy Dreams, Appleicious, and Angel Food Cake. 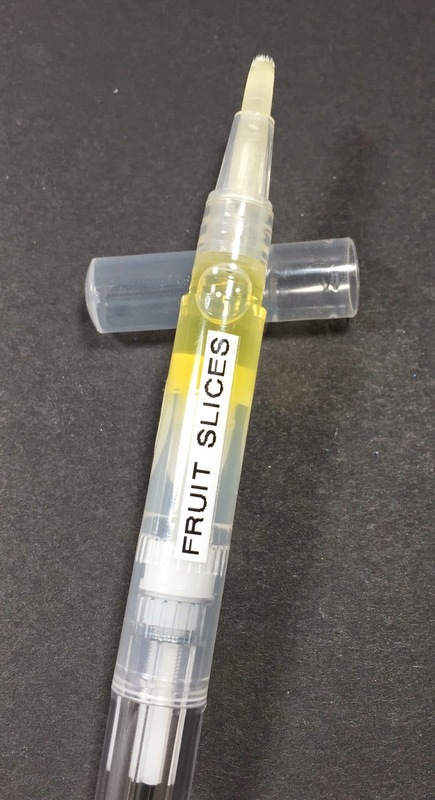 Fruit Slices is heavy on the citrus and it is blissful. I bought it because my mom used to always buy me fruit slices. It makes me think of her. Cotton Candy Dreams smells just like cotton candy (go figure LOL), it's super sweet! Appleicious to me smells like tart green apples. Lastly Angel Food Cake smells like sweet cake. The scents pretty much explain themselves and I can vouch for these that they are accurate. As of today I have used up about 90% of my fruit slices pen. My final thoughts...go buy some. NOW! They are reasonably priced and the shipping time is amazing. I really need to order some of these!! I love the different scent and container options! These look so nice! I really should order one for myself since they seem to be so handy to throw in a bag. Decisions decisions! What delivery method, what scent? In meantime I am trying to use up other oils to justify purchasing more...this time of year that should be easy! I love cuticle pens and from the sound of it I would love Appelicious! !